NYC, 05/04/2019, 1:00PM. 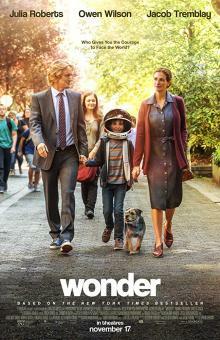 Wonder (2017): Oscar Nominated Drama Starring Julia Roberts And Owen Wilson. 113 min. Director: Stephen Chbosky. Starring Jacob Tremblay, Owen Wilson, Julia Roberts. At the 90th Academy Awards, the film was nominated for Best Makeup and Hairstyling. Wonder grossed $132.4 million in the United States and Canada, and $173.2 million in other territories, for a worldwide total of $305.6 million, against a production budget of $20 million.